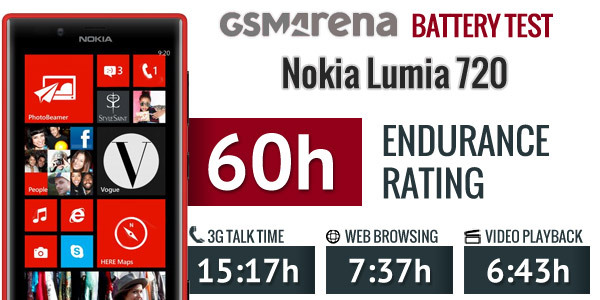 Will that make the Nokia Lumia 720 is the WP8 battery endurance champ? Nokia promises only about 13 and a half hours of 3G talk time from the Lumia 720, but the phone lasted considerably longer than that in our test, 15 hours and 17 minutes. That’s an hour longer than the 620 and a long way ahead of the next best WP8 phone we’ve tested, the HTC 8X at just over 11 hours. 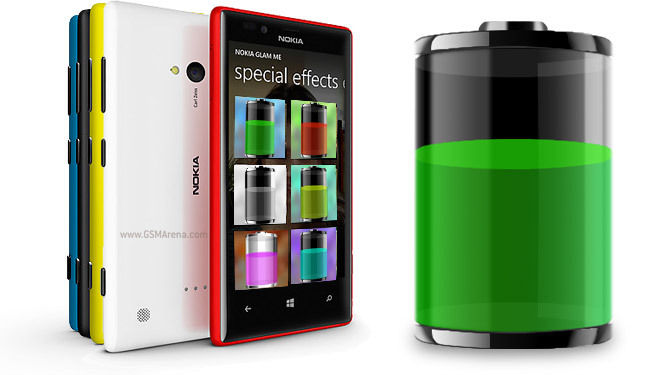 The Lumia 920 with a 2,000mAh battery, but more powerful chipset managed only 9 hours. The web browser performance continues with a very good time of a bit over 7 and a half hours. That’s 40 minutes shy of the Lumia 810 score (T-Mobile’s version of the 820), but that one aside the next closest WP8 phone is the HTC 8X at 6 hours. It turns out video decoding isn’t the Nokia Lumia 720’s strong suit. Then again, this seems to be a trend for WP8 phones, with only one in our database scoring higher – the Lumia 610, which has a single-core CPU and a smaller screen. The rest of the WP8 phones we’ve tested are within 20 minutes of the 720’s time. Finally, we get to the endurance rating. The standby was impressively efficient and it helped the Lumia 720 score a rating of 60. That’s how long it can go between charges if you do an hour each of calling, browsing and watching videos per day. You can learn more about the test here. The only potentially weak point of the Nokia Lumia 720 is video playback, but then you can’t really get a WP8 phone that does much better. Other than that, the 720 offers talk time and web browsing endurance that rival high-end Androids. The low standby power draw means you never need to consider switching off the Wi-Fi overnight too. Oh, and don’t forget that you can equip your Lumia 720 with an optional wireless charging shell too.